I am finally home from the whirlwind educational tour in Northern Europe which ended with a splendid event in Oslo, Norway (brrrrrrr). Pictures of various things along the way will be posted at the end of this posting for those who care (or for those of you with nothing better to do). Since my dog didn't bite me when I returned I guess she still remembered me. Of course she hasn't let me out of her sight for even one minute lest I try to escape again (and she's keeping a watchful eye on my suitcases as well!). As I type she is helping me out by leaning her head on my laptop (making sure I don't type any false tip information). 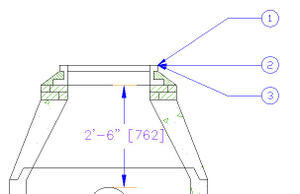 This can be done with the very cool MLEADERCOLLECT command (also found on the Multileader panel of the Dashboard). And Voila! Your balloons are all collected together ever so nicely - couldn't be easier! 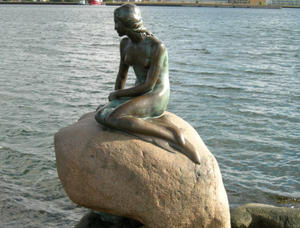 While in Copenhagen I saw the famous "Little Mermaid" (based on Hans Christian Anderson's story - also from Denmark). This poor thing has had her head sawed off along with her arm over time by vandals...so very sad! 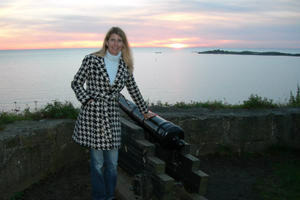 I managed to catch a beautiful sunset while visiting a fortress in Sweden...lovely! 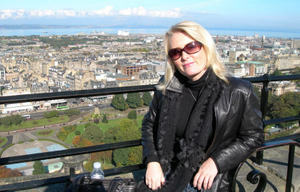 Dénelise l’Ecluse (the one who organized this whole event and my wonderful travel companion throughout the tour) and I had a little time to visit the Edinburgh Castle between speaking events - Here is a picture of the lovely Denelise up at the castle overlooking the city. And those Scotts sure love their dogs! (and you can imagine how much I love that). 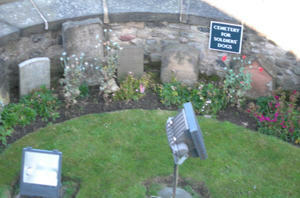 I took a picture of their Dog cemetery up at the castle. The soldiers felt very strongly about their canine companions. And last but not least the beautiful room at the Edinburgh Zoo where I did my presentation. My presentation was interupted by the Penguin feeding outside - I can't say that I've ever been interupted for an animal feeding before!!! Hilarious!